Here's the character design book for the Japanese 3D animation Yona Yona Penguin. 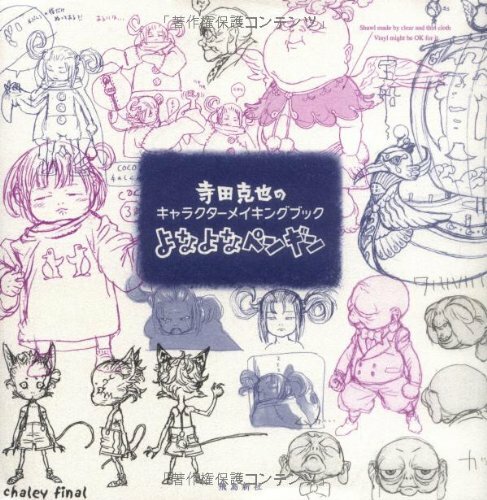 The title of the book よなよなペンギン 寺田克也のキャラクターメイキングブック translate to Yona Yona Penguin: Katsuya Terada's Character Making Book. It's a 136-page paperback with a square format. Katsuya Terada (寺田克也) is the main character designer. The book consist mainly of character sketches, mostly black and white. There are lots of interesting characters and designs. Some of them are a bit too sketchy though. You won't see any finalized work or 3D models. The style here is also much more simpler as compared to the Terada's usual complicated and detail illustrations. Most of the drawings are on the right side of the book. The left side is commentary of Terada talking about the characters. So effectively, only half of the book is on the sketches, slightly less than what I expected looking at the sketch-filled cover. Right at the back is the actual interview with Terada. If you know Japanese, there's a lot to read in this book. It's a nice little art book, but recommended more to fans of the animation or Katsuya Terada. I really, really love "too sketchy" content! Very neat.